Boost the range of your existing WiFi and create a stronger signal in hard-to-reach areas. Is there a void between your WiFi router and your devices? Add a WiFi Extender and strengthen your connection. 1.Please connect to "Wireless N" signal before you login the website to configure. 2.Please confirm the "Security Key"is correctly enter,it's same as your home WiFi password. 3.If there is any product technical inquiries,feel free to contact "szamake@sina.com"
Please check the power adapter ,whether it's installed accurately. Confirm the Security Key if entered correctly,if not,reset and then follow the manual to configure. 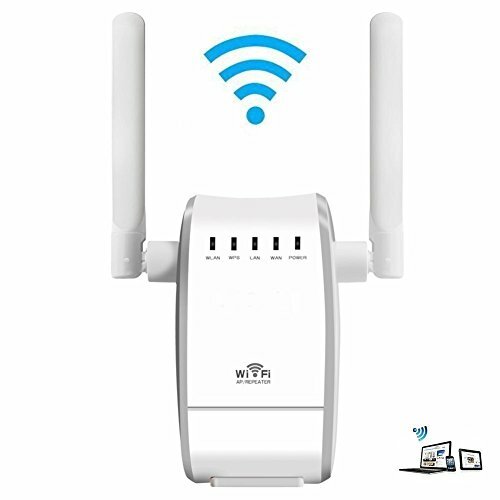 Confirm the configuration had finished successfully.Before login the website to configure,confirm you had connected to "Wireless N" signal so that you can login successfully. After you configure it,please wait for several minutes so that the repeater can restart and sync to the router. This repeater works to help extend the wifi signal range,and the speed is half of the original router,if it doesn't work,check whether it's configured successfully.If it's still not work,try to reset this item and follow the manual to configure it again. If you have any questions about this product by ameky, contact us by completing and submitting the form below. If you are looking for a specif part number, please include it with your message.